As usual, I'll ask you to recap our previous lesssons on safety, the use of open sights, the use of aperture sights, and breathing control before we begin today's class. All standard triggers can be grouped into two categories: singe-stage or two-stage. A single-stage trigger, as the name suggests, features a constant resistance to trigger pressure applied by the shooter. Once the requisite force has been applied, the hammer is released to contaact the firing pin and thus fire the rifle. A two-stage trigger, as found on many military and military-style firearms, features an initial stage of minimal resistance to the shooter's trigger pressure, followed by a final stage of greater resistance until hammerfall. In learning how to shoot your rifle effectively, you must first determine whether your rifle's trigger is a single-stage or a two-stage trigger. By dry-firing your rifle, after confirming, both visually and tactilely, that the chamber is empty and all ammunition has been removed from the rifle. In fact, you should never fire a rifle for the first time with a round in the chamber without first teaching your mind and body about its trigger via a few dry-fire executions. 1) Confirm that the rifle is completely unloaded, both as to its ammunition storage and its storage. 2) With the rifle pointed in a safe direction (remember- all firearms are always loaded, even when you have confiremd that all ammo is removed), disengage the mechanical safety and slowly press the trigger, after assuming a proper shooting position. 3) Cycle the rifle's action manually to recock the hammer and prepare for the next dry-fire "shot". 4) Confirm that your shooting position is still proper (much more on this point in subsequent chapters). 5) Slowly press the trigger, and repeat 3 and 4 once again. Note that I say "press" the trigger, rather than the more common "pull the trigger." The key to successful trigger operation is for the shooter to deliver into the trigger/hammer mechanism just enough energy to cause the hammer to be released without causing the rifle to move at all via the shooter's exertions. Too much energy and the rifle will move, thus causing your shot to move from the intended point of impact. Similarly, when you provide the wrong type/direction of energy into the trigger/hammer mechanism, you will also cause your shot to go other than where you intended. 1) Trigger finger placement: You should never have the front surface of your rifle's trigger any deeper along your trigger finger than the crease of the index finger's first knuckle. Better still is to place only the very tip of your trigger finger against the front surface of the trigger. 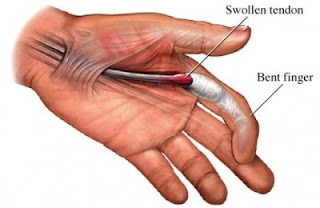 In the illustration above, proper trigger finger placement would be between the first crease (labelled "bent finger") and the end of the shading in that first finger segment. As long as the shooter can get sufficient muscle power, the optimal trigger placement would be on the finger tip at the end of the shading. 2) Direction of effort: As you begin your trigger press sequence, the musular effort should be directed into the trigger face parallel to the centerline of the rifle's bore. To the extent that such effort is not parallel to boreline and straight back towards the rifle's buttplate via a curling of your finger, your wrist, or both, you will be introducing lateral action into your rifle that will move its muzzle and thus the placement of your shot. Straight back and only straight back. 3) Quality and quantity of effort: Remember, all you want to do is deliver sufficient energy into your trigger so that the spring pressure energy of the rifle's hammer is transferred to the firing pin. The delivery of that energy should be done as smoothly as you can possibly muster, and the pressure that you apply to the trigger's face should be very, very gradual. When I teach a class, I ask my students to take the tip of their trigger finger between the index finger and thumb of their other hand. Slowly squeeze the trigger finger tip such that you can barely feel the increase of pressure. Doing so helps to illustrate, in a tactile way, the quality and quantity of pressure needed to achieve a successful trigger press. Finally, you will read, on the 'Net and elsewhere, some discussions about "surprise trigger breaks" and "controlled breaks". Both camps have their points, but what I have found to be most effective for me is to know, via repeated dry-fire and live-fire executions, when the trigger is just about to break. This so-called "controlled break" allows me to concentrate on my sight picture and, when just right, place just the slightest bit more energy into the trigger mechanism so that the hammer falls as my sights are correctly on target. Thanks for coming by, and make sure to come back next time when we talk about the basics of cheek weld and shooting positions. The way I was taught trigger control in the army was for someone to lay a dime on the front sights after you assumed a good firing position (unloaded weapon of course). If when you squeezed the trigger the dime came off or moved then you were not using the proper technique. Thanks for your comment. Gonna use that exact drill in the next section.